If you have sleep apnea, your energy levels drastically reduce, and so do your pulse rate and blood oxygen levels. Scientific studies1have shown that oximeters are 30 percent better at diagnosing sleep apnea in patients than traditional means. How Does a Sleep Apnea Pulse Oximeter Work? What Causes Oxygen Deprivation in Sleep Apnea? In other words, you cannot get a good night sleep when you have obstructive sleep apnea. Check the video below for a demonstration of oxygen deprivation during sleep apnea as seen through the data released on a finger oximeter. Doctors can use the best pulse oximeter for sleep apnea to determine the levels of oxygen in your body in percentage form. This measurement is known as the SpO2 (or, the oxygen saturation level). The normal oxygen saturation level in the body is between 95% and 100%. Sometimes, the blood oxygen level may drop but not for long enough or low enough to be considered unhealthy or abnormal. For example, there shouldn’t be any real worry if the blood saturation drops for a couple of seconds with 80% for two times in one night. To monitor your blood oxygen levels during sleep, you can use a nurse pulse oximeter or go to a sleep lab to have an overnight sleep study. A pulse oximeter is useful for people suffering from sleep apnea. The device is cheaper than the cost of a sleep study and can show important information regarding your sleep quality or the effectiveness of your sleep apnea treatment. When worn, a pulse oximeter provides a record of your heart rate and blood oxygen saturation level. This information is essential for monitoring the quality of sleep, especially if you usually have apnea episodes when sleeping. Watch the video below to understand why it’s important to use a portable pulse oximeter if you have sleep apnea. Generally, sleep apnea pulse oximeters are expensive and most insurance companies do not cover them. On the other hand, pulse finger oximeters are quite cheap. The best pulse oximeter for sleep apnea is the Concord Fingertip Pulse Oximeter. This oximeter is safe for use by both adults and children and does all the standard measurements that the best pulse oximeters do. You just have to press a few buttons to measure your blood oxygen saturation level and the heart rate. The Concord pulse oximeter has a shock-resistant cover for safety. The device is powered by a long-lasting battery that will stay on for at least 30 hours of continuous use. When not in use, the sleep apnea oximeter will automatically shut down to preserve the battery life. When the battery gets low, you will get a notification through its inbuilt indicator. The Concord Fingertip Pulse Oximeter is a high-quality device that features an inbuilt alarm that will alert you in case your blood oxygen saturation levels have dropped below the amount you have set as the baseline. The alarm will also alert you if your pulse rate has exceeded or is lower than the levels you have set. The pulse oximeter has a 2-way rotating display that makes it easy to use. 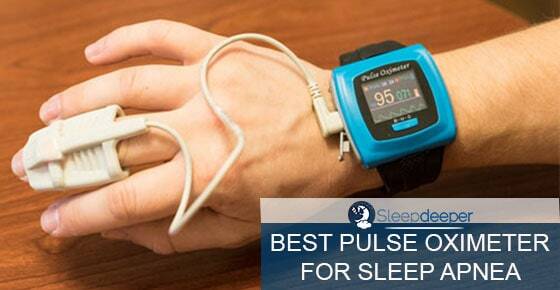 This is our recommended pulse oximeter for sleep apnea. The Facelake Pulse Oximeter has a clear digital display that provides oxygen blood saturation and pulse rate readings. The device is fast and shows your readings in under 10 seconds. The oximeter is powered by a long-lasting battery and comes packaged with a wrist/neck cord as well as a carrying case. The Facelake Pulse Oximeter has a 1-year warranty that covers technical defects and broken screens. 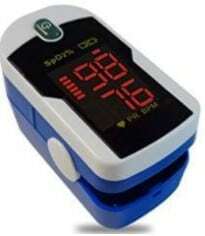 This oximeter is usually used by sports enthusiasts like those going camping but can also be used for sleep apnea. The pulse oximeter comes with a free nylon carrying case. If you prefer a pulse oximeter with advanced tech features, the iHealth Air Pulse is for you. This oximeter keeps track of your heart rate data and blood levels, which you can later share with your doctor for analysis. The oximeter can also measure your perfusion index. The Air Pulse Oximeter for sleep apnea has an app that you can use to access your data on your smartphone. To determine your measurements, the device calculates the average measurements after you have used it for about 30 minutes. 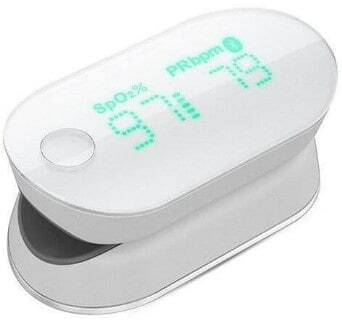 The Air Pulse oximeter looks sleek, is portable, and reliable. The clinically tested pulse oximeter has been approved for use by the FDA and does not use external batteries. To charge it, simply use the standard USB cable. This pulse oximeter for sleep apnea will automatically shut off after 8 seconds of inactivity to save the battery power. 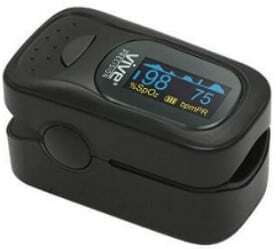 The Vive Finger Pulse Oximeter is a simple sleep apnea oximeter that is easy to use. The device provides results of irregular blood oxygen saturation levels of your body almost instantly. An alarm will alert you if your blood oxygen saturation levels are low or your heart rate is irregular. The Vive pulse oximeter is light, portable, and produces accurate results. The Vive pulse oximeter is safe for both adults and kids as it doesn’t pinch the finger. The oximeter’s large LED display makes it easy to read the results. This sleep apnea pulse oximeter comes with a 2-year warranty. A sleep apnea pulse oximeter records the heart rate and your blood oxygen saturation levels. However, the device does not indicate whether an increase in heart rate or a drop in oxygen blood saturation is caused by arousals or apnea episodes from sleep. Sometimes, drops in oxygen levels may be caused by other illnesses like COPD or asthma. However, if you already have sleep apnea, a portable pulse oximeter can help you monitor the effectiveness of your treatment. To track your progress, simply wear the oximeter on your finger while sleeping and then check in the morning the data that would be recorded on your computer. Bottom line is, a pulse oximeter may not help to diagnose sleep apnea, but is a great way of monitoring any treatment you may be undergoing. 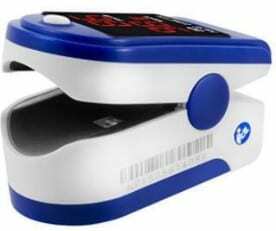 Your insurance company is not likely to buy an oximeter for home use. However, they will pay for the overnight oximetry service provided by local DME suppliers. Generally, insurance companies do not pay for oximeter equipment, even if you have chronic obstructive pulmonary disease. (COPD). If you have COPD, you can ask your doctor to script an overnight oximetry whilst using your CPAP. Your DME provider will issue you with an oximeter that you can use overnight. You will have to return the oximeter to the DME provider the next morning and the oximetry data will be downloaded and faxed to your ordering doctor. Depending on the data sent, the doctor can decide whether or not to order 02 supplements with our PAP. Generally, the oximetry test is not sufficient enough to indicate whether you have sleep apnea. However, using a pulse oximeter is helpful if you are on treatment for a breathing disorder. Moreover, the device is cheap and provides important information. SleepDeeper.net is a participant in the Amazon Services LLC Associates Program, an affiliate advertising program designed to provide a means for sites to earn advertising fees by advertising and linking www.sleepdeeper.net to Amazon properties including, but not limited to, amazon.com, endless.com, myhabit.com, smallparts.com, or amazonwireless.com.